Lancôme is set to release their Holiday 2013 Collection on November 1st, but today I have a sneak pick at one of the pieces in this collection. 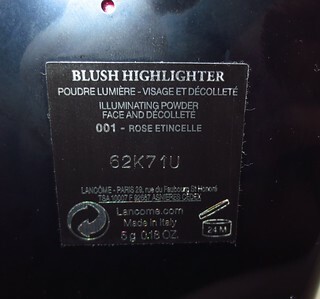 Lancôme's limited edition Blush/Highlighter in Rose Étincelle* ($52 CAD/5g.) is the stand out from this Holiday Collection, in my opinion. "As though the Lancôme rose were captured in crystalline frost…Subtly pink in hue, this iridescent powder instantly illuminates every complexion. Simply apply with a brush to beautify your face and décolleté." Inspired by the magic of a snowy winter scene - the satin radiance of snowflakes, the crystalline glitter of frost - Lancôme adorns women in enchanted light. Shades of iridescent white and silvery grey are enhanced by a subtle hint of red, glistening in unison to create that holiday ambiance. As though illuminated by a shower of crystals, this irisistable limited edition collection's products offer the most radiant make-up imaginable: eyes are haloed in lights, lips dazzle, nails sparkle... Lancôme creates a collection of refined luxury, for a holiday season defined by absolute chic." This product is labelled as a blush/highlighter, but I personally think that it is too glittery to be worn as a blush. As you can see in the picture above, I layered Lancôme's Blush/Highlighter in Rose Étincelle over top of Benefit's Hervana blush. 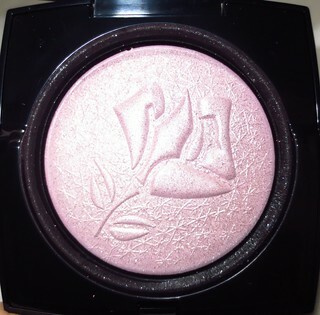 Lancôme's Blush/Highlighter in Rose Étincelle is a beautiful light baby pink shade with silver shimmer & glitter. This highlighter is quite strong, so this isn't for someone going for the subtle look. I think that this is the perfect highlighter to include in a holiday collection, because it will be great to wear to holiday parties. I like to apply this highlighter with a fluffy blush brush, so that it doesn't go on to concentrated. 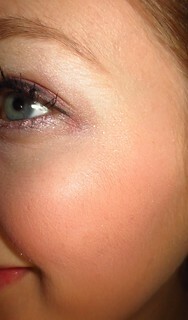 Adding a little bit to your cheekbones will really brighten up your face, and give you a lit from within look. You can also wear this on your décolleté for an added dose of shimmer. 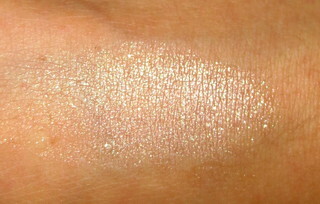 Even though this highlighter has a ton of shimmer, I didn't experience very much fallout from it. This highlighter lasted about 6 hours on my cheeks before I needed to reapply. Overall, I think that this product will make any highlight-lover extremely happy. 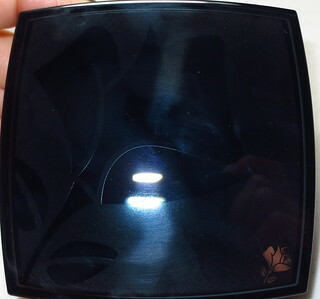 Lancôme's Blush/Highlighter Rose Étincelle is limited edition, and will be available at Lancome.ca and Lancome counters as of November 1st 2013. Will you be picking up this gorgeous highlighter? I cannot use Lancôme for some reason I break out and my skin gets itchy. The blush design and color its pretty.